So it’s been quite some time since I posted something here, but rest assured I have much going on. After an unfortunate Windows update, I had to reinstall all my software, which means, in the music world, QUITE SOME TIME to say the least between all VSTs, serial number tracking, activations and so on (and I have only done ONE computer… the laptop will wait). Between the new Ballistic Frogs project for which I write in addition to doing the music, and that, I had trouble making progress on releasing the Psycho Starship Rampage soundtrack but I am getting there and I thought it was time for a little update and let you know what has been going on. Recut and rearrange the tracks for an album release. Most of them are designed to loop since there were initially used in a video game environment, so I have to build clean edits that gently fade out instead of the “chunks” that are used in the game. That I couldn’t do without having Ableton back and running. Finalize the paperwork and legalese – I need some info for that such as the exact track durations, that I can’t know until I’ve done the final cuts. All in all, it’s not a lot of work to be honest, but that software glitch really was a pain in the nether regions and pushed back that project for weeks until I could finally get things in almost working order. Now it should all finally converge. I will keep you updated, of course. In the meantime I also keep building my arsenal for that next project. I can tell you one thing: it’s going to be epic. I am going to delve deeper into orchestral atmospheres, leaving for a while the more electronic territories. The game demands it… You’ll see. I can’t wait to start putting things together in Ableton and post some extracts. 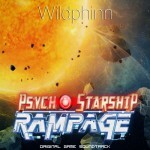 Pingback : Wildphinn » A present for all Psycho Starship Rampage players – new track!